This is my first tweet in a while, and I’m not using Twitter.com or a specialized Twitter client in order to do so. I’m using the Publicize feature of WordPress.com, which can set configured to send posts to Twitter and to Yahoo Updates. Tweets are the toenail clippings of social media. Twitter is a platform because it enables third parties to index the toenail clippings. It sounds silly, and maybe it is, but Twitter has caught on, rather as home computers did all those years ago. Perhaps they are on the decline now, as mobile devices are on the rise. I haven’t quite given up on Yahoo, so when I saw the ReadWriteWeb post about the new Yahoo mobile homepage, I decided to give said homepage a try. I got round to it this morning, and was at once underwhlemed and amazed. The home page itself was underwhelming. The “content” was the amazing part. Under the Today tab, the lead story is “Nobel Stunner: Obama wins peace prize.” It claims that Barack Obama has won the Nobel peace prize. While I am certainly not anti-Obama, I don’t see that his months (not years, not yet even one year) as President make him a serious contender for the award. Yeah right, and Yahoo has just launched “the world’s most advanced mobile homepage” (those are the words of a Yahoo exec). Rather, it has used an April fool’s day in October ploy to garner publicity for the new homepage. I guess I fell for it. I occasionally post MP3s here and elsewhere. I’m not really a music blogger. But, thanks to Box.net and to its anonymous accomplice, I felt like one recently. I received what I think is my first takedown notice. Hence Crowded House’s lovely acoustic version of “Fall at Your Feet” can no longer be heard at my WordPlay blog. The post affected is about the Yahoo Media Player (see also this post here at Changing Way). I don’t know who objected: Box.net didn’t specify in the email they sent. I’m sure it wasn’t Neil Finn or any other member of Crowded House, living or dead. Author andrewPosted on October 1, 2009 Categories Blog, Fun, UncategorizedTags box.net, crowdedhouse, music, takedown, yahooLeave a comment on Music Blogging, Playing, etc. 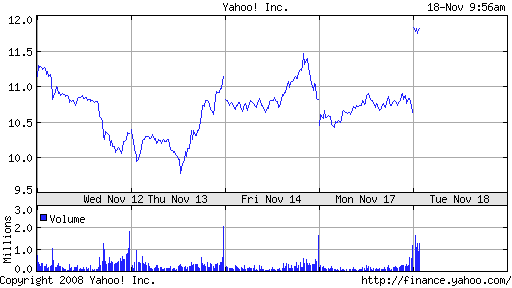 Even though its stock has plummeted, Yahoo still has a lot going for it. For example, there’s the more than 200 million Ymail users (including me, although andrew at changingway dot org is the best address for email related to this blog). Many have remarked that Yahoo should do more with and for that userbase (again including me). How about Ymail as an application platform? That would be obvious, and perhaps late, given what Facebook, Google, and others have been up to. But better late than never, and Om reports that Y seem to be taking the better course. The program is expected to launch in beta relatively soon with half a dozen small applications running in a sidebar inside the Yahoo mail client (Evite is one of the services that is said to be building a nano-app for this new Yahoo Mail-as-a-platform). Users’ address books would act as a social graph, essentially turning Yahoo Mail into the basis of a whole new social networking experience. So Jerry Yang is out as Yahoo CEO, and many sites have covered the news is various ways. I love the coverage on 37signals’ blog, because of the juxtaposition of the Yahoo/Yang news and the job board. And no, I haven’t checked to see if the Yahoo CEO position is on the 37s job board. I won’t be applying. I hope that The Flickr Founders will. At the time Yahoo acquired Flickr, I wished that Flickr could take over Yahoo. I haven’t seen much since then to change my mind. Whether they would want the job is, of course, another matter. Here’s another Yahoo-related image. It shows that the stock opened sharply up this morning. That’s good news, since I bought some Yahoo stock a few days ago, on the basis that: things would either improve, or Yang would step down; and when Yang stepped down, the market would like the news. Now, all we need is some news to take the stock back over the price at which I bought it. By the way, for those wishing to know my stock positions, in order to avoid them: I bought Google at the same time as I bought Yahoo, albeit for very different reasons.